Though large in size, the Philips HF3520 Wake-up Light is a nice mid-range alarm clock with high-quality amenities. Light therapy alarm clocks can run fairly expensive, but spend too little and you end up buying low-quality alarm clocks that might not work as effectively. The Philips HF3520 Wake-Up Light is a high-quality product for a mid-range price. The combination of subtle design and fairly simple alarm options make it a good choice for people who not only want a solid alarm clock, but one that also doubles as a bedside reading light. At 9.9 inches by 4.6 inches by 9.2 inches (HWD), the Philips HF3520 Wake-Up Light is one of the largest wake-up clocks on the market. It’s also one of the clunkiest, weighing 3.6 pounds. When we pulled it from its box, we quickly were surprised by the weight. Despite the clunky dimensions, it does have a sleek, round design and sturdy rubber feet to keep it from slipping off your bedside table. Do note that if you have a small bedside table, you may find it to be a cramped fit. The HF3520 comes with two components: the alarm clock, and the AC adapter, and no assembly required. Since there are no USB ports or auxiliary plugs, simply insert the AC adapter into the clock and plug it into the wall and it turns on. Heads up, though — there is no backup power option or built-in battery so If the power goes out, the alarm will not function. Configuring the HF3520 clock proved fairly simple aside from a minor stumble. It started off by wanting us to set the time in bright orange, easy-to-read numbers, which was easy — until we realized that it wanted us to set it in 24-hour time. We tested it before bed, so we had to double check to make sure we woke up on time. Thankfully, you can swap 24 for 12-hour cycles once the time is set up and the home interfaces pops up. Once the clock is set up, the home Interface and side buttons are very easy to locate and use. The home interface has four touch buttons: a Minus button, the Menu, Select, and a Plus button. Pressing Menu provides the following options: home interface brightness, two alarms, alarm sounds, and time. The side buttons control the bulb’s brightness and the FM radio. Most of the fine-tuning of the HF3520 will come from this menu. Physical buttons along the rim turn the light on/off, turn on the FM radio, and turn the alarm on or off. The HF3520 sports two separate alarm systems, so you can wake up on weekdays and weekends at different times. A nice perk is that the alarm time flashes for ten seconds once we pressed the button, and we could quickly adjust the time rather than go through the home interface again. The Philips HF3520 sports five different alarm sounds: two birdsongs, calming music, waves, and the FM radio. The volume gives you options up to level 20, as does the brightness levels, giving you plenty of different options to customize your alarm. One problematic drawback, however, is that we could not set the alarm until we ran the alarm test which required us to press and hold the alarm button on the rim for three seconds. This feature demonstrates the entire alarm process by cycling through all the alarms over a 90-second interval, but maddeningly, won’t turn itself off until you press and hold the Alarm button for another three seconds. The HF3520 sports two separate alarm systems, so you can wake up on weekdays and weekends at different times. One nice quality about the HF3520 is that the lights don’t automatically switch on when the alarm starts up; instead, it gradually brightens using signature red, orange, and yellow hues until your chosen sounds begin at alarm time. The audio quality could be a little crisper and more finely tuned, but it’s still a pleasant, clear sound that’s less harsh than the shrill alarms you’re probably used to. We were also fond of the fact that tapping the rim top snoozes the alarm for an extra nine minutes, giving you the perfect time to soak in the light which remains on during snooze. After nine minutes, the music gradually begins again, rising in volume until it reaches the preset level. Aside from its primary purpose as an alarm, the Philips 3520 also comes with other useful features. It has basic FM radio capabilities, but lacks USB or auxiliary ports. We also tested out the reading light capabilities, and were able to read by the LED bulb with ease once we adjusted the brightness level to 20. Any lower and we would have strained our eyes reading a hard copy book, but it would be a good option for a night light on a lower setting. The HF3520 also comes with a very convenient bedtime feature: simply press the “zzz’s” button on the side, set the time for anywhere from 5-60 minutes, set the sound, and end your day as the bulb simulates a setting sun with shades of vibrant yellows, oranges, and red. The Philip’s has a large price tag, but taking into account its amenities compared with competitors, it’s worth the cost. At a $139.99 MSRP, the HF3520 at the middle of the pack for wake-up alarm clocks. While you can certainly get a cheaper option like a Totobay Wake-Up Light for under $30, you sacrifice the features that make this a nice gadget, such as audio quality, the reading light option, and the orange and red hues that help simulate a sunrise. The Philip’s has a large price tag, but taking into account its amenities compared with competitors, it’s worth the cost. The Philips HF3520 Wake-Up Light has a pricier, fancier sister on the market: the Philips Somneo clock. At $199.99, the Somneo is more expensive than the HF3520, but comes with extra features to compensate. The Somneo offers seven different alarm sounds, while the HF3520 offers five. It also has USB ports for phone charging and listening to your favorite Spotify playlists via the 3.5mm audio jack. If these extras aren’t a big deal, then the HF3520 would be the better option, since you still get the same great audio and gradual brightening features. If every amenity is a must-have, then the Somneo is the right option for you. Want to see some more options? Check out our best wake-up light therapy alarm clocks article. Large and clunky, but a solid addition to any bedside table. 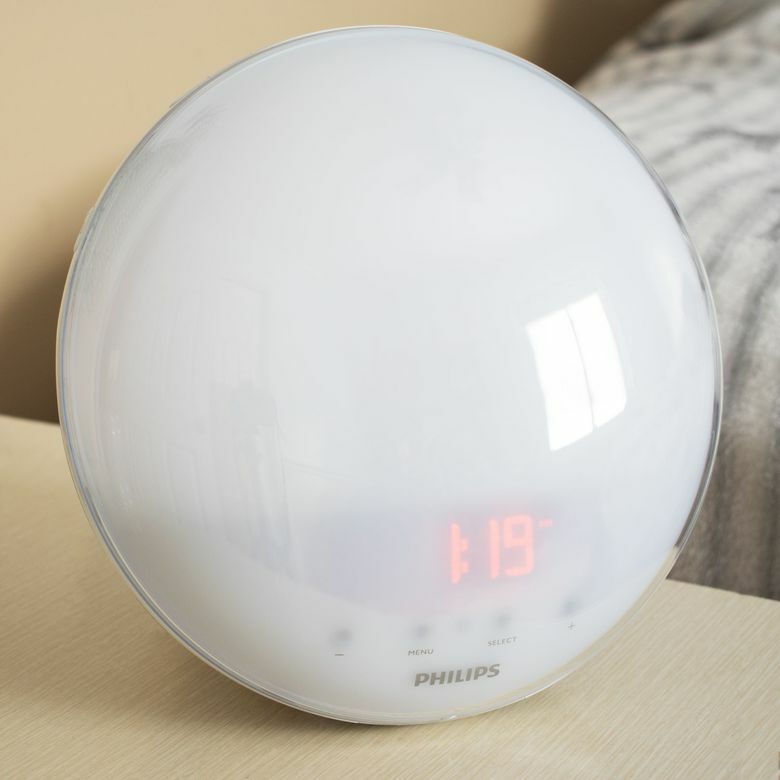 The Philips HF3520 is a great mid-range light therapy alarm clock that performs well and won’t clean out your wallet. Designed for basic use and featuring some solid amenities like a reading light and a decent radio, this alarm would be a solid addition to any (large) bedside table. Product Dimensions 9.9 x 4.6 x 9.9 in.